In the year since Donald Trump was inaugurated, you’ve probably eaten over a thousand meals—some of them memorable, some of them not. The best ones stuck out because of who joined you at the table, what you ate, if not the combination of the two. But one thing all those meals had in common was this: they were likely made possible by immigrants. Unless you grew them yourself, the ingredients were grown, processed, transported, and/or prepared by at least some immigrant hands. And yet, over the last year, much of the country’s public dialogue—and its president—has been stridently anti-immigrant and often overtly racist, as people and policymakers have ignored not only the fundamental importance of immigration to U.S. history, but also its importance to our present economy. It’s no overstatement to say that the day-to-day operations of the country are now resting on the fate of immigrants. Leyla Moushabeck knows that food has power. 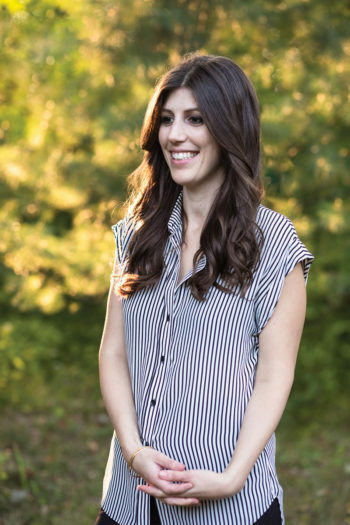 She is the cookbook editor at Interlink Books, which has just published The Immigrant Cookbook: Recipes that Make America Great, a book that seeks to highlight the power of food, and immigrants, to make change. The book features recipes from nearly 80 contributors, representing about 60 different countries of origin. Each cook provided a recipe and a reason—the memory, the story, the delight behind the meal. And as with Julia Turshen’s Feed the Resistance, some proceeds from the book’s sales will be donated to the American Civil Liberties Union (ACLU). Moushabeck, who herself is the child of immigrants, spoke to Civil Eats about the relationship between immigration and food, her vision for the book, and how she feeds her sense of hope. 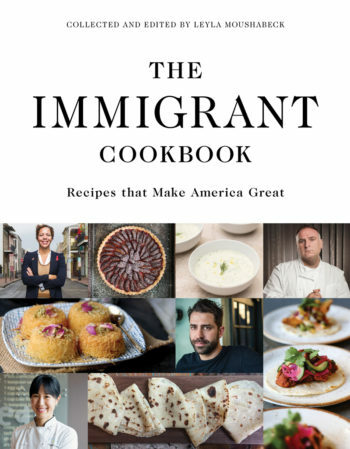 What’s the story behind The Immigrant Cookbook? How did your vision for it change as it grew? It has always been Interlink’s mission to publish books that promote cultural understanding, but in recent years we have felt a need to take more direct action to support the causes we are most passionate about. Two years ago, in response to the growing Syrian refugee crisis, we published our first fundraising cookbook—Soup for Syria: Recipes to Celebrate Our Shared Humanity, which gathered soup recipes from chefs around the world and successfully raised hundreds of thousands of dollars in funds for the UNHCR, Syrian American Medical Society (SAMS), and other food and medical relief programs. It was hugely successful and sparked an international movement, inspiring fundraising and outreach across the globe. We have since built on this initiative and published one fundraising cookbook each year. We felt we could do something similar to celebrate the vast contribution of immigrants to American food culture, and raise funds for the (now more than ever) important work of the ACLU. A minimum of $5 from the sale of each book will be donated to the ACLU’s Immigrants’ Rights Project, to directly support their work defending the individual rights that the laws of the United States guarantee everyone in this country. In the introduction to the book, you touch on how the food industry depends on immigration. What were you most surprised to learn about this relationship while developing the cookbook? As many of us are aware, almost all of the foods that we think of as classically “American” originated with an immigrant community. Today, so many of the amazing chefs shaping American cuisine are first- or second-generation immigrants. But I was struck by the scope of influence immigrants have on our food culture, not just in terms of the variety of foods we eat. From an economic perspective, immigration has huge implications for our food industry. Immigrants (legal as well as undocumented), make up the vast majority of the labor force of America’s farms, food-production factories, grocery stores, and restaurants, often facing hard work with low pay and few benefits. Ethnic diversity continues to be a fundamental strength to this country and its development, but it is often overlooked. While the book can’t represent every immigrant experience, I hope it will highlight some of the valuable ways our culture is shaped by our immigrant populations. And I hope it will inspire discussion, and raise awareness of the ACLU’s important work to support the rights of the many immigrants who contribute to our economy and culture in sometimes less visible, but equally significant ways. How is food unique in its ability to connect people? Food holds a basic and instinctive importance to every human culture. It can celebrate or console, bring families and communities together, or provide a path to exploring heritage and homeland. It can be used for cultural appropriation and as a demonstration of power, but it can also be a medium through which to learn about another culture, and can pique the interest of those who may not otherwise venture outside of their own experience. 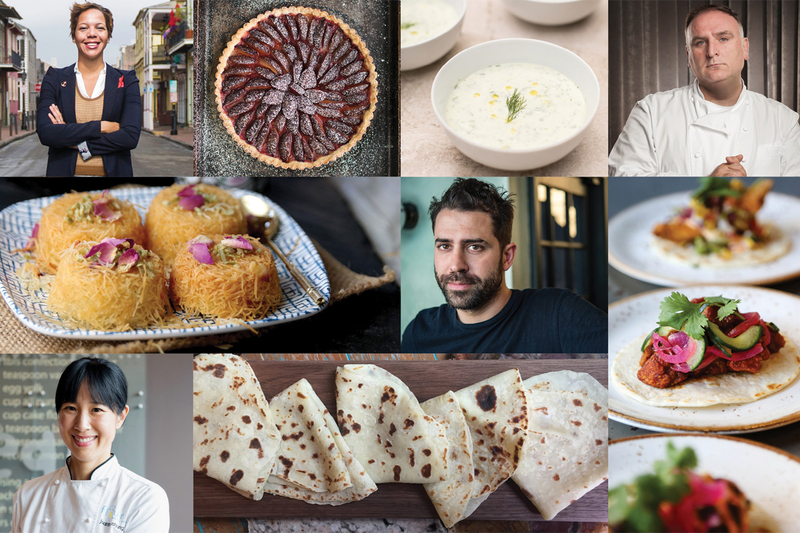 When asked to choose a dish that best represented their experience, many of the chefs in The Immigrant Cookbook relayed stories of family gatherings, favorite relatives, and childhood memories. By reading their stories and cooking their dishes, you are connecting with another person and culture, inviting it into your home to share in your family traditions, and gaining a small glimpse into another experience. Sometimes simple encounters like these can go a long way toward promoting understanding. But if you read their stories side-by-side, you can also find strands of common experiences—stories of family, home, and culture told through flavors and ingredients. So there is much that will be familiar, too! As a collection, The Immigrant Cookbook is a very special reminder of the universal bonds between community and food. How did you select the chefs who contributed? We read newspaper and magazine features, cookbook and restaurant reviews, and food blogs, and asked our cookbook authors and food contacts for their recommendations. Alice Waters and Barbara Abdeni Massaad (with whom we worked on Soup for Syria) were especially helpful. We looked at statistics about immigrant populations, as well as those groups that were specifically targeted by recent government actions. And, in fact, it was not difficult to find leading immigrant chefs who are making a difference. Our aim was to feature a diverse range of people, not just ethnically, but also professionally: We included restaurant chefs, food writers, television hosts, food producers, and educators, from James Beard Award winners and Michelin-starred restaurant chefs, to emerging voices in food writing and the people behind beloved neighborhood institutions. Some were approached because they are using food in interesting ways to tell stories or foster discussion. Many use their food as a tool for activism or to support community building. Some of the recipes are traditional, some are the result of cultural fusion, and some are regionally unspecific. But every recipe was chosen because it means something to the chef, and speaks to their personal journey. In the face of targeted anti-Muslim bigotry, Reem Assil has used her Oakland bakery to provide opportunities to marginalized local communities and local progressive movements. Tunde Wey travels the country having difficult conversations about race and immigration through his dinner series, Blackness in America. Nadia Hassani’s project “Cooking-with-a-hyphen” brings neighborhoods together over food through a series of potluck dinners celebrating diversity. Cathal Armstrong has been a longtime advocate for locally sourced food and sustainable business practices through his Virginia restaurant, gaining him recognition from the Obama administration. José Andrés has famously led an on-the-ground operation to feed Puerto Rico in the wake of Hurricane Maria, and has been a vocal opponent to institutional discrimination… It is the people that make America a special place. You mention your Palestinian and British upbringing and that you’ve picked up the Colombian recipes of your in-laws. If you were to include a recipe, what would it be? I don’t envy each of the contributors to this cookbook having to choose one recipe that encapsulates their experience, or represents their connection to their origins and journeys. I could choose my grandmother’s lentil soup, a simple, hearty, warming soup flavored with cumin and cilantro, which I can cook with my eyes closed, and make whenever I feel cold, or down, or in need of comfort. My grandmother always wore her jewelry, even in the kitchen. I can still hear the sound of her bracelets jangling as she picked through the lentils to remove stones. My mother and aunts each have their own versions using tweaks developed in England, or Canada, or the U.S.
You write that these recipes “capture the spirit of what makes America great.” Is America great right now? How do you fuel your hope? James Baldwin wrote in Notes of a Native Son, “I love America more than any other country in the world, and, exactly for this reason, I insist on the right to criticize her perpetually.” It is not greatness when a country lacks the compassion to take in those seeking refuge, or care for people in need within its own borders. It is not greatness when a country spends more on weaponry than on education or healthcare, or ignores growing environmental concerns. A country’s greatness is measured not by how rich the 1 percent is, but by how it treats its most vulnerable citizens. By that measure, the U.S. is tragically failing us. But there is also a growing climate of resistance. In putting together this book, I encountered countless examples of the creative ways people are working to combat racism, support local communities, promote sustainability, cultural communication, or access to healthy food, and address the myriad complex social issues we face under the current administration. We found that nearly all of the chefs we approached—from famous restaurateurs to small business owners—were enthusiastic about coming together to share their stories. An outpouring of support for the book and its mission is just one small indication of a hopeful future.